If you are a Twitter user, your tweets are probably an important part of your online activity. Why not take a backup every now and then? After all, things happen, and having a backup never hurt anyone. Plus, your Twitter archive is the best way to browse through your timeline, back to your very first tweet. 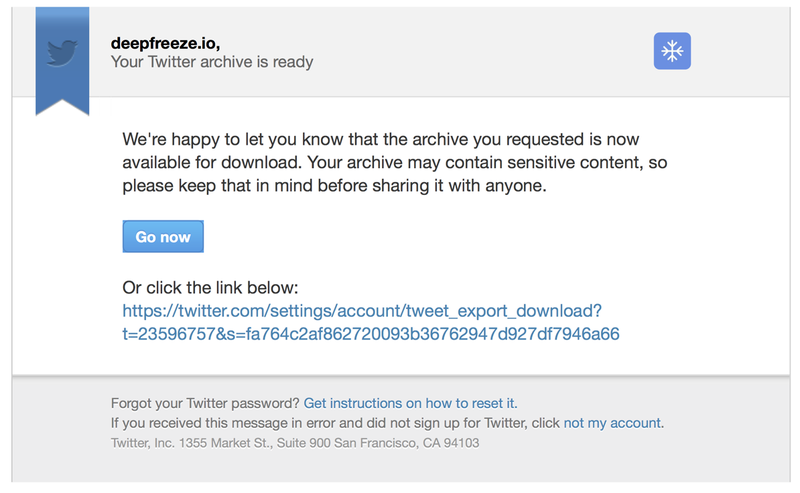 First, go to your twitter settings page, and click "Request your archive". A few minutes later you will get an email from twitter. Follow the link. You will land back to your settings page, but this time there will be a "Download" button —click it. Your archive will be downloaded as a ZIP file. That's it! You can unzip it and click index.html to browse the downloaded archive. If you are a long time Twitter user, you will also appreciate the fact that you can easily go back to your very first tweets, something that's not trivial to do on twitter.com. One step further: improve the exported archive. All media files (photos) are served dynamically from twitter. Which means that if they are deleted or taken down, they will not be available in your local archive either. The same goes for user avatars: You will get "broken" avatar images even if a user changes his. All links are "shortened", using twitter's URL shortener. Even worst, many users use their own shortener of preference. If a URL shortener changes their URL structure, or goes out of business, etc., you will not be able to follow these links from 2 years ago. As far as I know, there are no easy fixes for these issues. Download it and run in a terminal python ./download_twitter_media.py. I've uploaded my personal twitter archive, after running the script against it, here: As you can see, all images (even avatar images), are served by my own server, not twitter. This post was originally posted to BigStash blog, which no longer exists. Hmmm.. It's been a year since I updated my twitter archive, I'd better do it soon.